Several Legionnaires participated in two wreath-laying ceremonies at Arlington National Cemetery this week. 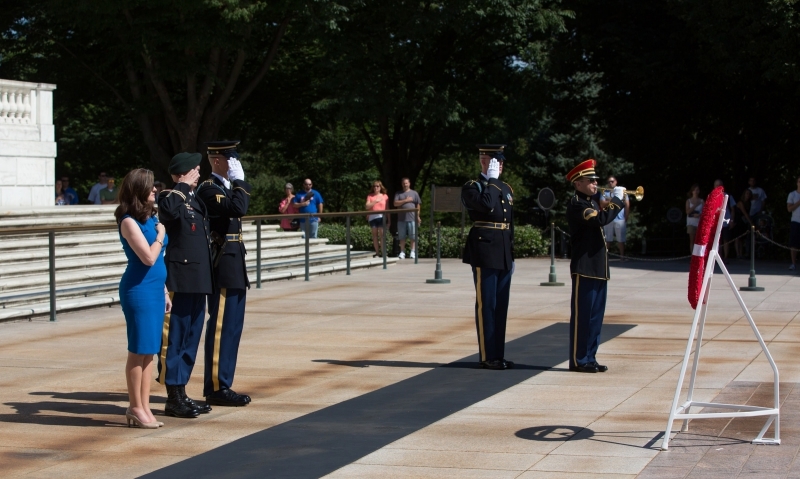 Legionnaire and Volunteer Director for Soldier’s Wish, Mark Ochsenbein, laid a wreath at the base of the Tomb of the Unknown Soldier July 11 on behalf of Soldier’s Wish. American Legion Department of Virginia Commander Dave Stein and Vice Commander Frank Hillyard represented the Legion while placing a similar wreath July 12. Both wreaths were made from small red satin roses that were sent via direct mail to The American Legion and Soldier’s Wish donors and supporters. Those who wished to donate to each organization mailed the roses back with a small donation. The roses that were received were then fashioned into wreaths for each organization. The Legionnaires said their trips to Arlington Cemetery were unlike any other time they previously visited the hallowed grounds. The Legion has a long history of supporting the nation’s veterans, noted Chuck Krupa, American Legion Marketing Production deputy director. The $444,000 raised through The American Legion’s mail campaign will be funneled directly into Legion programs that support veterans, servicemembers and their families. The fundraising effort was especially meaningful to Stein, who holds a special place in his heart for programs like American Legion Baseball, which he participated in during his childhood. As he placed the Legion’s wreath – made with more than 35,000 satin roses – on the stand in front of the tomb along with Hillyard, Stein said he felt an overwhelming sense of pride during the ceremony, especially when the soldier guarding the tomb announced The American Legion. This was the first official ceremony Stein participated in after assuming his duties as department commander July 9. Sydney Schanberg died last week. His work casts a giant shadow on Arlington Memorial Cemetery.